Atlassian’s visual organization tool Trello is releasing a new solution for discovering, managing and organizing Power-Ups. Trello was acquired by Atlassian With the new Power-Ups directory, development teams can easily search for the right Power-Ups for their workflow, and implement it to their Trello boards. “If you are unfamiliar with Power-Ups, they are additional features and integrations that can be enabled on boards to provide a custom-fit Trello experience for your specific use case. For instance, Power-Ups can be used to add a calendar to your board or custom fields to cards, create automations with Butler and Zapier, or pull in up-to-date information from apps like Evernote, InVision, and Dropbox,” the Trello team wrote in a post. 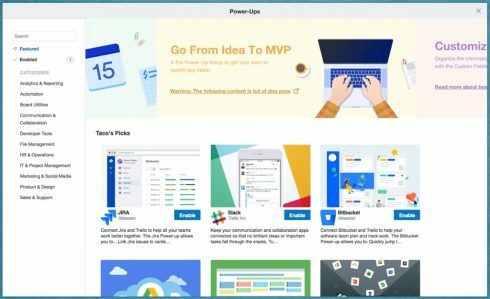 The new Power-Ups directory will feature more than 80 public Power-Ups designed for popular applications such as Slack, Google Drive and Bitbucket. Developers can also custom build their work Power-Ups for their specific business needs, and share it privately. The new directory will also include a featured section to highlight some favorite Power-Ups as well as articles on how to maximize Power-Ups capabilities. Developers will be able to search the directory by categories such as analytics and reporting, automation, developer tools, and IT and project management. “This year, we more than doubled the number of Power-Ups on the Trello platform, and we hope the redesign of our directory will attract even more top developers to build for Trello,” said Hamid Palo, head of platform at Trello.